Those who read the previous piece about the Melkite Greek Catholic liturgy with Bishop Nicholas in Berkeley today will have read this already, but it was buried away at the bottom of the piece, and it occured to me that some who don't live in California would be interested to read this, so here we go. 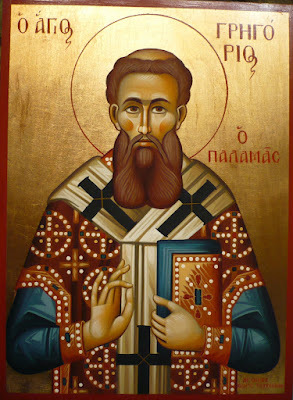 In the Melkite Church, the Divine Liturgy for Sunday, March 12th, the Second Sunday of Lent, is a commemoration of the theologian St Gregory Palamas, the Orthodox bishop of Thessaloniki in the 14th century. I became aware of him through various icon painting classes which referred to him in connection with the theology of icons, and his doctrine concerning the light of sanctity, the “uncreated” light of Christ. This is the basis, for example, of the painting of the halo, a symbolic representation of the light on holiness, and of the fact that the Saints cast no shadow when they are painted, for they are the source of the light that obliterates shadow. Very often Palamas and Aquinas are pitched against each other on the doctrine of deification. There has been work to reconcile the work of the two, for example this book by AN Williams. 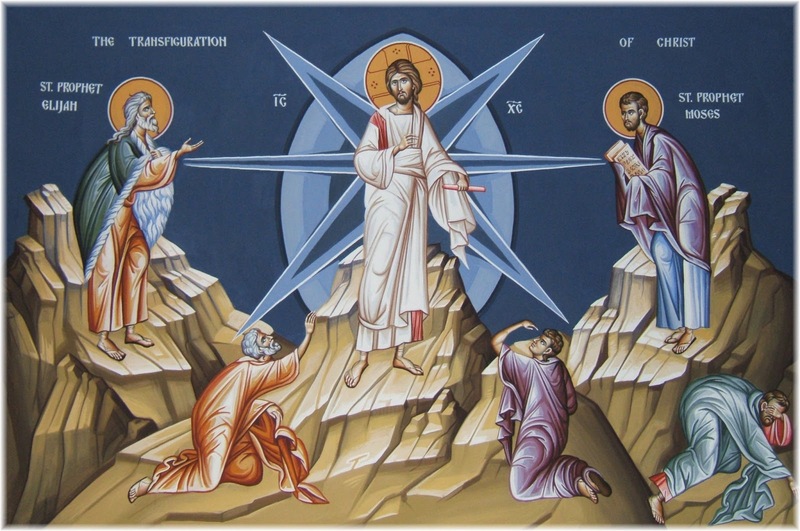 Here is my own perception of this in very simple terms, which relates to an interpretation of the Transfiguration. Years ago, I was told of a difference between East and West in the interpretation of the event of Mt Tabor, namely, that St Thomas Aquinas argued that Christ changed when He shone with light, and this was an anticipation of the beatific vision. 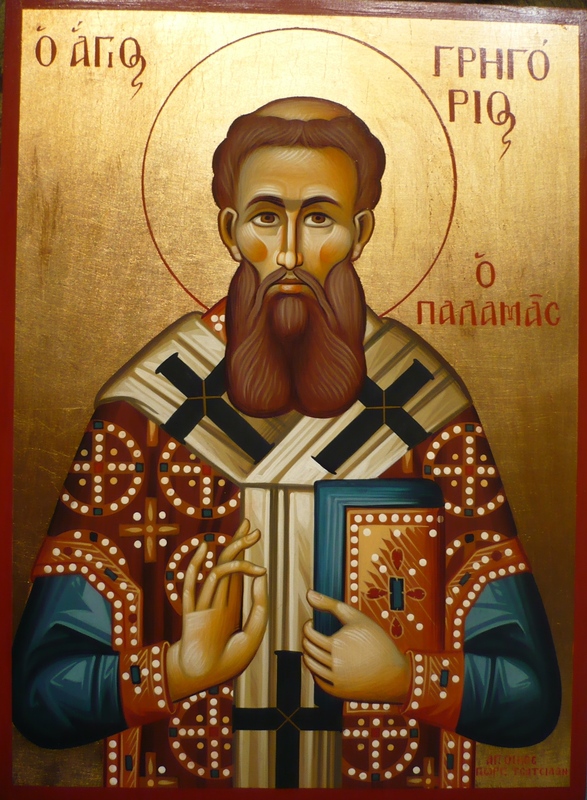 St Gregory Palamas, on the other hand, argued that the Apostles changed spiritually and were able, temporarily, to see the uncreated light of Christ; their climbing of the mountain was a metaphor for their spiritual upwards movement towards a greater purity in heart. Furthermore, through the sacramental life of the Church, it is possible for all of us, by degrees, to grow in purity and be transformed so that we can both witness and shine with the uncreated light of Christ. As Our Lord told us, blessed are the pure in heart, for they shall see God. As I thought about this, I raised this point, which I thought was a contradiction, with a Benedictine monk at Pluscarden Abbey in Scotland when I was on retreat there once. He told me that I should “think liturgically,” and suggested that these two interpretations were not mutually exclusive. There might be a dual motion taking place in some way, so that just as God comes down to us, so to speak, as Christ is present in the Eucharist, so in taking communion we are supernaturally transformed, potentially, and so are raised up to meet Him.